We can bet almost everyone has some special photos containing awkward moments and silly facial expressions that are now used as a great source of amusement. Childhood will never come back, but the spirit of it can be remembered. Recreating photos from the past allows us to come back and see these warm carefree times and be children again, even if it’s just for a while. GIGGAG found 25 old photo remakes that will make you feel like you’re in a time machine. 22. The Same Boy, The Same Rug, The Same Granny’s... Knickers? 18. Nothing Is better Than A parent’s Arms. 15. 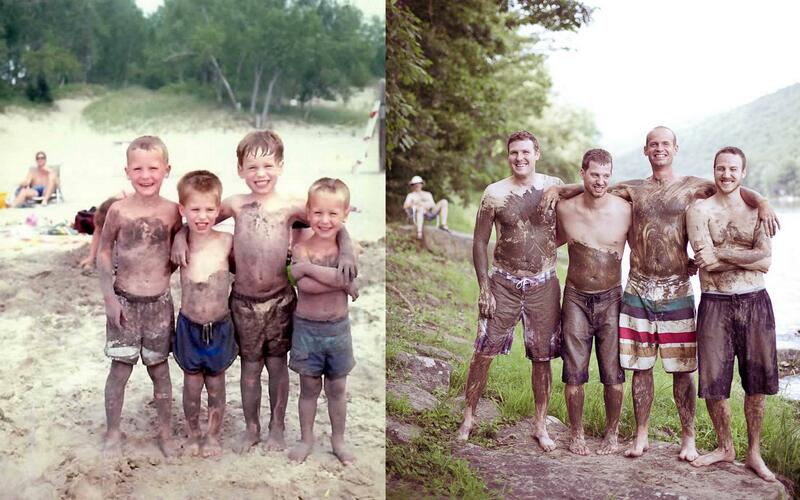 Years Go by but The Fun Stays. 14. Just Pretending To be a human Frog. 11. Snow White And...the Seven Dwarfs? 8. They Grew Up but Still Fit In the Box. What Kind Of magic Is this? 7. Even After So many Years, You Have To take Care Of your Little Brother. Do you have some funny photos from your childhood? Have you ever tried to recreate them? Share them with us in the comment section!